Yesterday marked two years in the blogosphere for this little ol' blog, and they've been good ones! Much has happened! Much remains to be said! Much remains to be heard! 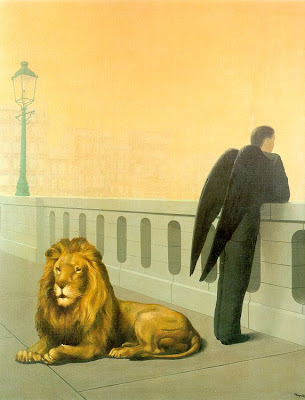 And as to the above painting (by Rene Magritte), it's there for the same reason that I started blogging: I thought it was cool, and I just felt like it! What a cool painting...I want to hang it in my house. Congrats on your 2 year blogaversary!! I check your site daily as it since it is either entertaining or thought-provoking. Take care and enjoy what's left of our vacation. The blogosphere just would not be the same w/o you! I am so glad that you decided to take the plunge two years ago. Happy Blogoversary!! Happy Blogoversary to you! And many more, I hope! Love the painting- especially since one of my favorite Paul Simon songs happens to be "Rene and Georgette Magritte With their Dog After the War". Keep up the good work, "longhair!" Dear Ms. Cornelius: I admired your Movie Madness feature, even though I am woefully ignorant of most movies. Most of all, however, I admire your perseverance: Two years' blogging is something to celebrate. Hope you had a great party to mark the occasion! It's really colorful and you have some cute pictures. in the cabinet cold og their hearts? The Prioles, and the Five Satins...."
By the way, I have no internet right now. Sorry.